Look at this crazy contraption. This is Trigger Point Performance Therapy‘s product, The Grid. And Swim Bike Mom readers can save 10% (details below). Now, The Grid is not to be confused with the traditional foam roller. The Grid is the traditional foam roller’s hot, younger sister. Love at First Lay. Er, Roll. The Grid came in the mail about a week ago. I’ve got all sorts of hip, knee, hammer, and IT band issues stemming from not-so-stellar first triathlon performances, the wearing of way-too-high heels, feats of klutziness and general poor running form. (Oh, and from wearing my fat suit). Okay, so I’m a bit of a mess. Literally and figuratively. I’ve been battling these issues for a while. TP Therapy has helped me tremendously over the last few months, but I was still using the ugly sister foam roller. So this fancy pants Grid was to be interesting. I had a massive swim, bike, run workout on Sunday, and I prepped for it Saturday by “rolling” on Friday and Saturday. The workout on Sunday was the biggest of my life. I walked away sore…but not broken. And this morning, I had 7 miles of hills in the dark and in the rain, and I felt pretty darn good. That’s a miracle. A week later, I declare and shout from the rooftops “I love the Grid!” And here’s why. The Grid is small. It fits in sane places in my house. My children do not ride it like a pony. In fact, despite the fun color (orange…also available in black), the children are completely disinterested in the Grid. This is a big plus. Also, because the Grid is a little more than one-half the side of a traditional foam roller, rolling only one quad, and focusing on smaller areas is much easier. I can place on leg on the floor as support and roll the other quad. Same deal with the IT band. The isolation is ideal. Even for someone with buns my size, there is plenty of room to roll those buns out. The Grid has special grooves called “matrix and distrodensity zones.” (What?) Okay. The grooved places on the product that feel more like fingers/elbows/hands and actual massage. I find that as I roll over the grooves, it’s must easier to find those tough spots and focus on them. I can really feel the difference of these grooves in my calves and glutes. Old foam roller was so not groovy. Wait, I thought the Grid was orange? It is. 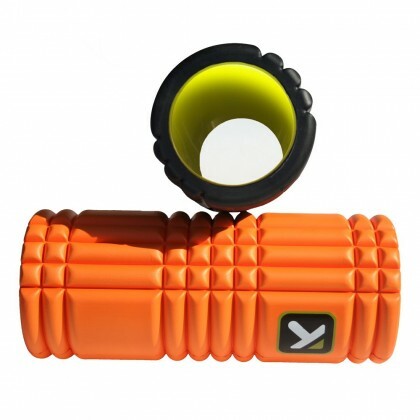 But the Grid is built with EVA foam and uses less foam than traditional foam rollers. Apparently, despite it diminutive character, it is designed to withstand constant, heavy, and repeated use without breaking down. I wasn’t sure I believed this. And really, only the test of SBM rollling around in her fatsuit will prove this. But it feels sturdy. It doesn’t compress at all. The rolling on the Grid hurts like the devil, way more so than the foam roller. Pain in trigger point therapy = good = effectiveness = feel better. I have been using the Grid from my Achilles tendon to my upper back. Seriously. From head to toe. Or ankle to neck, if you want to be picky. The Grid is $39.99. A traditional foam roller is $20-30. This is definitely worth the added expense. And through the end of the month, you can get 10% off with the SBM Promo code (below). If you use this link and promo, you’ll get 10% off your Grid. Good through 10/20/11. It’s a SBM exclusive promo. Whoop! I hope you guys have a chance to try it out. Could just change your body and your life. Just sayin. I love my Grid. Worth every penny. Plus it does not break down like a regular foam roller. I've had mine almost a year and it looks the same!